In this number counting game, you venture into the Zapzapmath jungle, and you come across a very long and hungry snake. It’s slowly slithering, it starts a hissing, its tail is shifting; it could be you it’s almost eating! The snake is fast approaching, but do not get rattled! Luckily for you, snakes in the Zapzapmath ecosystem are not only harmless, but they are also big eaters of fruits. Yes, fruits! From blueberries, to apples, to kiwis, to melons… these alien snakes sure know how to enjoy the best things in life! Alas, this starving one-eyed snake has made a mess of all the meals it had previously prepared. Its fruits are scattered all around, and it does not recall which should come first. It is up to you, fearless mathling, to nourish this silly, famished snake! There are fruits all over the ground. Each fruit is labelled with a number, and all the numbers are in a sequence. The snake must be fed in the right sequence of numbers. Otherwise, it gets really sick. To nourish the snake, guide the snake towards the right direction of the next number in sequence to guide it, counting forward as you proceed along. Keep feeding it in the right numeral order, and it will show its loving gratitude to you. If you feed it the wrong sequence, it will get ill. Be careful not to guide it into the walls or obstacles, for it will injure itself and suffer painful bruises! Counting Snake is a counting game that advances number recognition to sequence recognition. In Counting Snakes, you will learn to distinguish numbers 11 and beyond. As you train yourself on how to count forward through the identification of number patterns in our number counting game, you are establishing a systematic approach to the basics of mathematics by rote count sequence. Rote counting is a concept that teaches young learners number names and how to count forwards or backwards in order. This number counting game develops rote counting skills by requesting you to distinguish numbers from 11 to 20 and beyond, and to count forward by 1’s. By collecting fruits in a specified structure, you are applying numerical awareness with critical thinking. 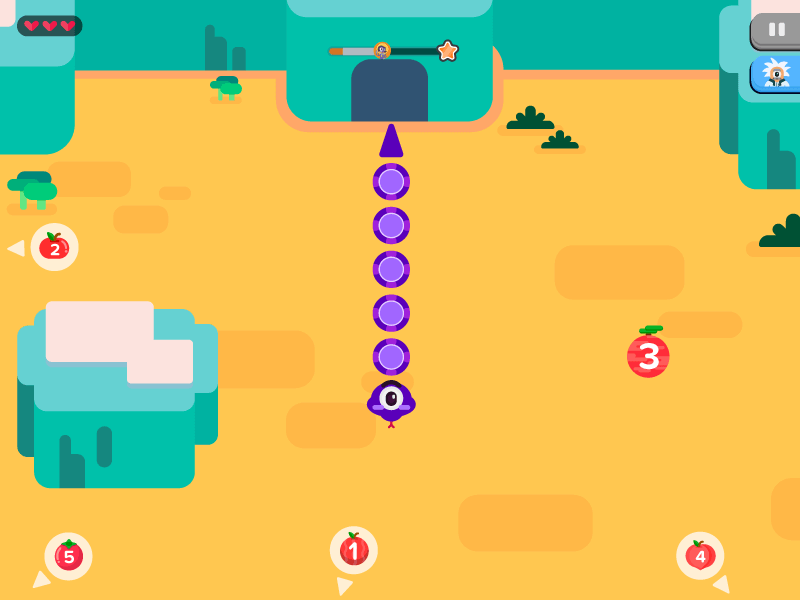 The gameplay is designed to encourage training of hand-eye coordination, with careful and swift maneuvering required to guide the snake through its course. An acute attention to detail will allow you to identify the order of the numbers and which to approach first in this number counting game. The snake is getting hungrier by the minute, so grab those fruits and start feeding! Snakes love fruits and tasty counting!